I went to H’s wedding in Dubai last week. Actually, I nearly missed it. My flight was scheduled to take off from Heathrow at 20.30; bags had to be checked in 90 minutes prior to departure. Knowing that I would be leaving straight from work during rush hour, I had two options: walk or bus to Wimbledon, District Line to Earl’s Court and Piccadilly Line to Heathrow (approx 1.5 hours, plus staircases) or minicab. Normally I wouldn’t mind taking the tube, but I had a suitcase laden with presents and H’s wedding gift in my carry-on tote bag: 4 champagne glasses. You know where this story is going… So I opted for a minicab and must give due credit to the driver for a creative route and careful attention. It just wasn’t quite enough. We reached Heathrow at exactly 18.59, then inched forward in heavy traffic for over 20 minutes to reach Terminal 3. At this point, I was wondering how I would tell H that I missed her wedding by 25 minutes – and more to the point, if the number I had programmed in my mobile for her was even valid anymore. Kicking myself for not having confirmed her number, and resigned to having missed my flight, I ran nonetheless to the online check-in bag drop counter where a man was being served ahead of me. “Come on, come on, come on, hurry!” My turn! I shoved my passport and check-in confirmation across the desk and started pleading, “I know I’m late, but there was traffic and I’m going for my friend’s wedding and her father is a pilot for Emirates so won’t you please let me on the plane…?” when I realized that there was no problem at all. The woman kindly asked for my bag, printed out a luggage tag and boarding pass, and wished me a happy flight. Happy flight, indeed! I will spare you the details of my pushing my way through security, running through Duty Free, and screeching onto the plane out of breath and in severe need of water. (I shouldn’t need to add that I had had to guzzle down the last contents of my water bottle before throwing it out to go through security. I hate that.) As I boarded the plane, the flight attendants were all smiles and friendliness – they even gave me a fresh, new water bottle! Genius! The seat was comfortable, considering I was stuck in coach, and I believe Emirates is the only airline I have flown where all passengers get footrests. Huzzah! Free wine and cocktails, edible food (including fresh greens for salad – surely no one else does this, even Virgin), and a good selection of TV and films. Rock on, Emirates. But the trip had only just begun. I landed in Dubai at 6.30 in the morning after a few hours of on-again, off-again sleep. The airport was clean, quiet and big. Got my passport stamped, took out some money from an HSBC cash machine, and collected my bag. Outside, it was already humid. I met H and her cousin, R, who had picked up C from her Beijing flight earlier that morning. Everyone looked happy and relaxed, if not exactly awake. Immediately I noted with some dismay that H and R had already had their hands henna’ed… I was expecting that all the women would get their henna later in the day before the Mehndi ceremony. Apparently C had the same idea, and it was a relief when H assured us that we could still do it. Upon hearing that C and I were coming to the wedding, H offered to have a ghagra choli made for each of us to wear to the Mehndi ceremony. We sent her our measurements and she picked styles and colors for each of us (blue for C, green for me.) We tried them on and they were perfect. We were so excited! We folded them for later and went back to the busy pre-wedding preparations that seem to occupy women all over the world: manicures, pedicures and hair styling. We spent a long afternoon at the beauty salon being pampered. C opted for the hot paraffin wax pedicure; after watching her be tortured, I chose a normal one instead. Back at the house with the clock ticking, C and I were slightly sad to still have unstained hands. Big sister to the rescue! K grabbed a henna cone that just happened to be lying around, and started drawing free-form. I had thought there were traditional patterns or stencils, but it turns out that it’s mainly a form a decoration. 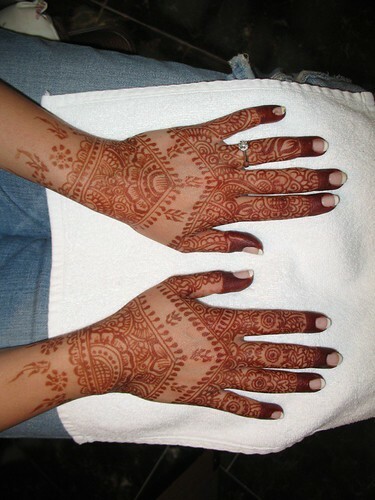 Some women just dip their hands in the henna so that they get stained but not patterned. Needless to say, C and I were exceedingly pleased with our pretty designs. We took H over to the salon across the road to have a long yellow rope braided into her hair. 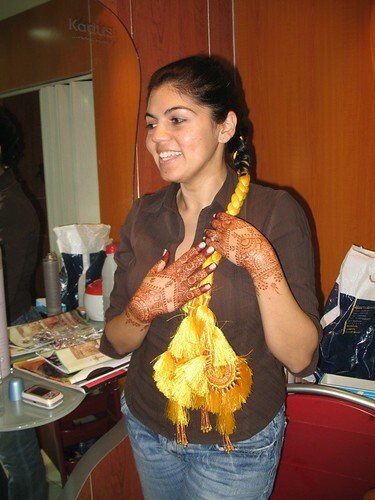 She had explained that the bride is supposed to look quite plain for her Mehndi. She doesn’t wear much make-up, and her clothes are meant to be bright yellows or oranges to make her skin look even more washed out. She is supposed to sit demurely and watch while family and friends perform dances and sing. All of this was a challenge for H who naturally glows and loves to dance. C and I had been invited to stay at the neighbor’s house, so when the time came we went over to get dressed for the party. Our hostess, A, was wonderful. She took our outfits to be ironed and offered to help with our make-up. I went into the bathroom and came out to discover C wearing this amazing red top and skirt! A ran upstairs to get something, and C melted. She pointed at her blue skirt lying on the bed. The maid had burnt it with the iron. There was an iron-sized piece missing right next to the zipper. There was no way to hide or fix it in time. It was destroyed. A had offered to let C wear the outfit she had worn to her own sister’s wedding, and C had little choice but to agree. But it didn’t stop there. A thought my green ghagra choli would be too simple next to C’s red stunner, so she brought me one of her mother’s outfits. The embroidery was dazzling – and heavy. After many protestations, C and I were dressed and bejewelled. There was still a nagging doubt that we would outshine the bride, but A reassured us that it was H’s night to look plain after all. We gathered our scarves (mine kept catching on the beads and earrings) and headed next door. The garden was transformed. Inside, H was waiting happily for her debut. If she was supposed to look plain, I couldn’t imagine what fancy would look like! (I found out the next night.) She was wearing the most deliciously fragrant fresh flowers and did not seem too upset about our outfits – there were clearly bigger things to think about. We went outside where the women were just beginning to sing. And wouldn’t you know? No sooner had I managed, in my own ungraceful manner, to sit down on one of the cushions than I noticed that some little kid had spit out their gum on the ground next to it… and it had stuck to the knee of the silk trousers I was wearing! I managed to pull some of it off, but they were clearly ruined. C’s skirt was burnt and I got gum on A’s mother’s party clothes. OH NO. I managed to hide it from A all night, but I felt awful. I spent all night tugging down on the shirt to cover the trousers, and pulling the earrings away from the scarf. Yup. Graceful. Beyond these unfortunate wardrobe malfunctions, however, I must say that these outfits are actually quite comfortable. The tops and scarves hide all your wobbly bits, and the trousers are baggy and loose. Brilliant! Meanwhile, all around us the guests were arriving. V’s family came in parade-style with more singing and fanfare. H and V were seated on what I can only call a throne, and immediately the families began welcoming and blessing them with sweets, henna and gifts. They brought sarees and jewels for H (I would not be surprised to find out that the diamond necklace and earrings cost more than my beloved SAAB – and that was just one set.) We were happily reunited with another SOAS classmate who came from Tehran for the wedding. The guests were mingling and eating. C and I guessed that this must be like wedding food anywhere – OK, but not great – but to non-locals like us, it tasted amazing. Perhaps the biggest difference was the drinks selection: juice, water, Coke and Diet Coke. While the rest of the ceremony was more cultural than religious, the lack of alcohol showed respect for our Muslim hosts. And then the dancing began! Earlier in the day, C and I had been recruited for one of the dances, which was arguably the least traditional and most comical of the lot: Mambo Number Five. H’s brother was in the middle, while eight of us danced a woefully laughable combination of the electric slide and Macarena on either side of him. During the chorus, he took us one by one and spun us from one side to the other. The house had a wonderful, family feel to it while everyone piled around the big table for the Pakistani version of a fry-up (yum!) and swapped stories. 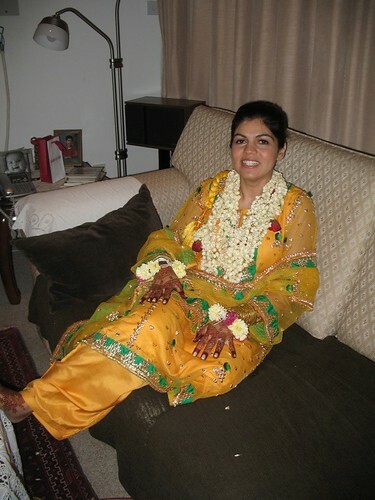 I should mention that H’s family is originally from Pakistan, but they have lived in Dubai for years. Her older sister lives in Detroit with her husband and two sons; her younger brother lives in Toledo (!) but will be moving back soon. 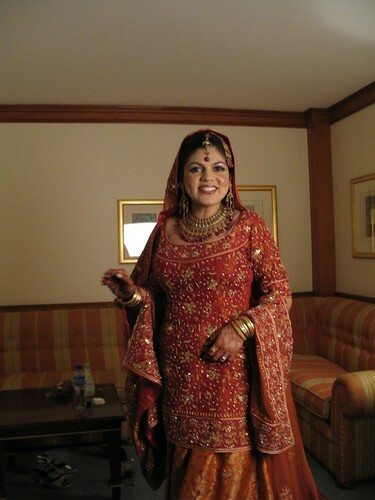 Her cousins are spread out across Pakistan and the USA as well, in Reno and LA (R’s family was ready to be evacuated at any minute due to the Orange County fires.) V’s family is from India and he has been working in Dubai for Microsoft, which is where he met H. It was a lovely, international group of people. In the afternoon, C and I decided to get out and enjoy Dubai’s favorite pastime: shopping. We headed to the Mall of the Emirates, home to Ski Dubai. Dubai is incredibly diverse and relatively liberal, and the mall is a bit of a microcosm. We saw women wearing tiny midriff-revealing tops and miniskirts, and other women covered from head to toe. The mall was not so different from what you would find in Connecticut or Essex, with the addition of shops selling shisha pipes and Persian rugs. C picked up a few things she cannot readily find in Beijing, and I soaked up the atmosphere. We got in a taxi and headed home. Back at the neighbor’s house, I put on my green top and skirt. C had borrowed a blue outfit from H. A helped out with accessories and make-up, and we headed to Le Meridien (conveniently located next to her parents’ villa.) H looked incredible. Absolutely gorgeous. The reception hall held 400 guests, about twice as many as the night before. We showered V’s family with flowers when they came in. V waited for H’s entrance on the stage. H was escorted by her brothers. Her veil was lifted through clouds of smoke, and as per tradition, the first man she saw was V. They spent most of the evening greeting guests and having their pictures taken. 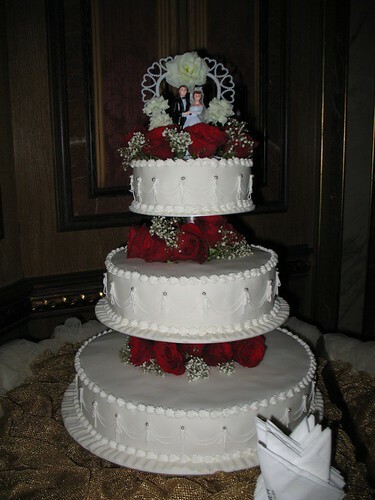 There was a bizarrely Western wedding cake, and a short bargaining session while H’s siblings stole a few of V’s items and made him pay them to get them – and H – back. The final buying price was not disclosed, but it is safe to assume that they did not let H go cheap. The reception was much more formal than the previous night’s celebration. The music was subdued and the tone was festive, yet restrained. The biggest shock (for me, at least) was when the bride and groom suddenly stood up and walked out of the hall. The place fell absolutely silent and the bride was in tears that set off almost everyone around her. H and V were settled into a stretch limo – at this point, C and I were confused. Weren’t they staying at the hotel? Wasn’t their suite just on the other side of the lobby? R whispered that they were going back to V’s house where his family would perform a small welcoming ceremony, then let them return to the hotel. And so with small waves and choked tears, they were off. My plane took off early the next morning. It felt like 2 weeks, not 2 days. Everything was so far removed from my reality that I am happy I have my pictures – and henna – to keep the experience alive. Oh – and the gold outfit! 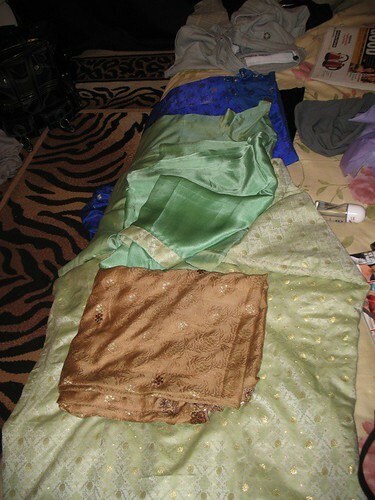 While we were packing after the reception, A insisted that we keep the outfits we had worn to the Mehndi. Was it pure generosity and kindness, or simply that I had ruined the silk trousers? I like to think it was more the former than the latter, but either way I am grateful. I am so happy that I was able to go to the wedding. All the best with your new life in Oman, H & V! Like I said...jewlels and clothes always capture my attention.